The long-awaited, oft-delayed 2D fighter Pocket Rumble will be launching on Nintendo Switch July 5th, a mere two weeks away from this writing. Originally released on Steam in 2016, the Switch port has been long-delayed since its February 2017 announcement, before the Switch itself even released worldwide. Developer Cardboard Robot Games attributed the port’s long delay to net code and approval issues. In the interim, the status of the Switch version had been a mystery wrapped in an enigma. 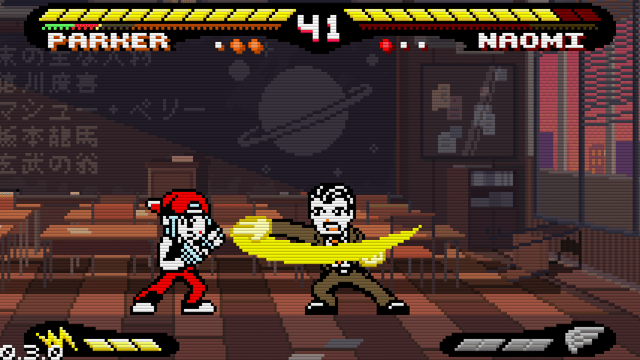 Interest in Pocket Rumble can be attributed in great part to its look and feel. It is a throwback fighter to the Neo Geo Pocket Color, featuring simplified two-button combat. Steam owners can look forward to extra content, including a fleshed-out single player mode, Kickstarter-made bosses, and the new playable character Morgana. These updates will be folded into the Switch version sometime after launch as a 2.0 update.